Edible beauty, it’s a thing. My #eattoglow philosophy centers around high quality ingredients, selecting the best quality ingredients ensures nutrient density for optimum skin health! 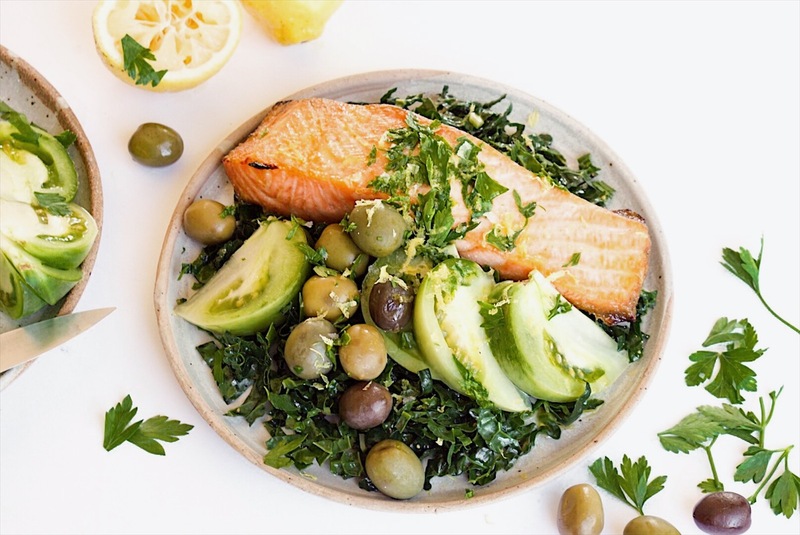 The latest #eattoglow recipe, Olivey Broiled Salmon Salad, utilizes the best healthy fats for a radiant glow. Lucky for us these high quality fats are as delicious as they are beneficial for our complexion. Extra virgin olive oil is an edible beauty staple in The True Spoon pantry. Calories be damned, I anoint my food in gleaming puddles of the green gold. Olive oil is something you should spend money on, you want to taste the quality of the fruit, yes the olive is a fruit. Your olive oil should be zesty, peppery, and bright, a true indicator that it endured minimal processing. 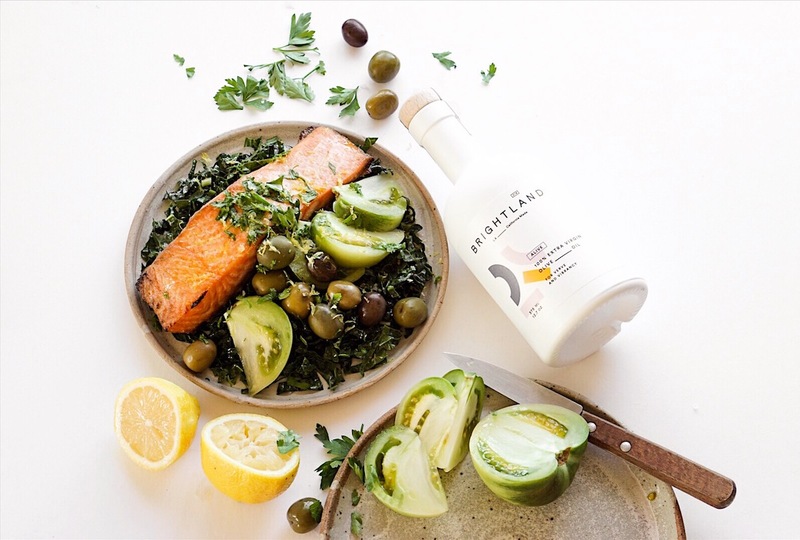 The less processing your olive oil endures, the more it maintains it’s antioxidant profile, providing anti inflammatory properties for your skin. 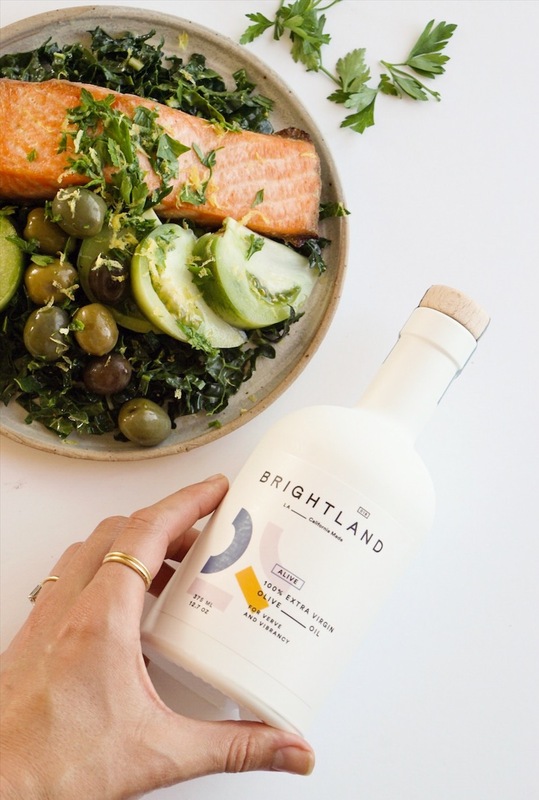 The Brightland olive oil CLICK TO BUY used in this recipe is the poster child for perfect olive oil, it exhibits all of the properties I rattled off in this paragraph, plus the bottle is just plain beautiful. Salmon is another ingredient you’ve just got to spend money on. Wild caught salmon is one of the best skin foods on earth. The wild salmon’s natural diet and lifestyle creates the perfect omega 3 fatty acid profile. The essential fats in salmon have numerous skin perfecting properties including, collagen protection from free radical agents, anti inflammatory acne prevention, and skin hydration retention. This simple fatty (in a good way) recipe will keep your skin glowing well into the new year! Enjoy this combination of ingredients at least three times a week for optimum glow. -Preheat oven to high broil. -While oven is preheating, add chopped kale to a medium salad bowl. -Add in 1 tablespoon olive oil, lemon juice, and pepper to bowl, toss until well combined, set aside. -Coat salmon fillet with remaining olive oil, place on a foil lined baking sheet. -Broil for 5-7 minutes depending on fillet size. -Plate salad, cooled salmon, tomato, olives. -Top with lemon zest and salt. This sounds and looks amazing!! Making for my Hubs this week!